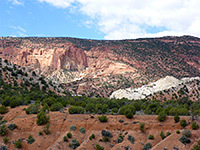 Unlike some nearby ravines, on the east side of the Waterpocket Fold in Capitol Reef National Park, Red Canyon is a relatively short drainage, and it does not cut right through the reef; instead the streambed leads to a wide, bowl-shaped amphitheater, enclosed on three sides by high red cliffs of Wingate sandstone. 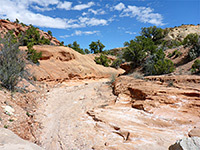 But as with the longer canyons, including Cottonwood Wash and Sheets Gulch, the canyon does have an official trailhead and a recognizable trail, here starting at the end of the short track to the primitive Cedar Mesa Campground, along Notom-Bullfrog Road south of Highway 24. The trail crosses open ground for 1.5 miles then descends into the wash, which can be followed for about another mile, though the views do not change much once within the amphitheater, and the streamway does not have any narrow, enclosed sections. The hike is not signposted from the road so is mostly done by people staying at the campground, which has about half a dozen sites, and there is no charge to stay. 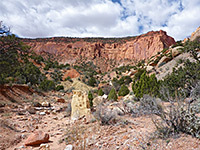 The place is named after a low, partly wooded mesa to the north, projecting eastwards from the reef, and split near its far edge by Sandy Creek, which runs through a brief canyon, and provides a course for the road ('The Narrows'). 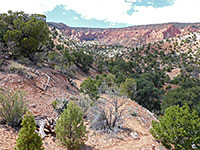 The turn-off for Cedar Mesa Campground is 21 miles south along Notom-Bullfrog Road, ten miles from the start of the unpaved section; at the far side of the camp is a small trailhead parking area, with space for a few vehicles. 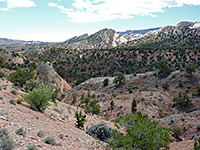 Red cliffs are visible in the distance from trailhead, through gaps in the pinyon and juniper pine trees, and at this point they look quite far away. The path, once a vehicle track, heads southwest over flat land of reddish earth, covered by sparse grass and the small trees; after a while it rises slightly to a whitish outcrop, at the end of a low ridge, which is followed northwestwards. The crest stays fairly level, as the land slopes down to little ravines on either side. The sandy surroundings are home to a good selection of wildflowers in spring, including astragalus musiniensis, Ferron milkvetch, a species endemic to the Colorado Plateau. 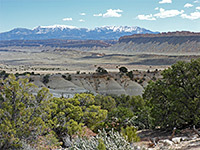 To the east are greyish hills of Mancos shale along the edge of Tarantula Mesa, with the Henry Mountains beyond. Beyond the ridge, the land rises gently until the path arrives at the rim of the wash that leads from the canyon; a cairned descent reaches the streambed, which looks to carry a lot of water at some times of the year. 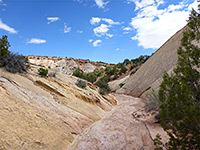 The trail crosses to the far side, running briefly through a small patch of tall pine trees, and returns to the wash; the remainder of the hike follows the creekbed upstream, past bands of rock of varying colors and forms, including cliffs, domes, hoodoos and ridges. The drainage gradually moves to the center of a wide valley, as several tributaries join from the west side, and the views remain somewhat limited owing to slopes and small peaks near the streamway; a little climbing is necessary for a good perspective of the whole amphitheater. Overall, the scenery is quite typical of this side of the reef, and maybe not so interesting in this particular location.